For a professional blogger, the custom domain name for his blog is must and this tutorial explains step by step procedure to add it for a Blogspot blog. It also explains how to redirect the root page and other posts successfully to the respective pages in a new address. This tutorial shows a practical example by redirecting a blogspot address to custom address. I am redirecting http://networksolutions4u.blogspot.com to http://www.corenetworkz.com. It is a two step procedure. First step is to enter CNAME and a-records in domain (registrar website) control panel and the second step is to enter the new address which you want to point to your blogspot blog. Before set domain name pointing to your blogger site from blogger account, you must enter the CNAME and A-records in the domain registrar's control panel. To do this step, you must log on to registrar's website. Under domain management, you can find DNS (Domain Name System) settings. In that page, you can enter the following information. For more information, I recommend you to refer the steps mentioned in the link below. A-records should point following 4 IP addresses. It may take hours to activate the DNS settings you entered in registrars website. After this, you should make following changes in blogger account. If you haven't added CNAME details at the domain control panel, you will see the following error. If you are seeing the alert, "We have not been able to verify your authority to this domain. Error 12", you must crosscheck the CNAME details entered under DNS settings in domain registrar's control panel. Now the custom address for your blogspot site is configured and you can access your blog through the new address. 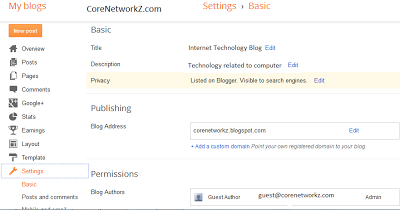 Now onwards http://networksolutions4u.blogspot.com redirects to http://www.corenetworkz.com. All the published posts too will be redirected to respective pages. Backlinks, bookmarks, PR etc gained by your Posts URLs will be transferred to the new URLs. Each blog posts will be redirected to the respective new URLs. The last point is also very important as the first two points because .blogspot or WordPress addresses are difficult to promote and look unprofessional. There are not many financial troubles associated with buying a new domain name because all you have to spend is around $10 per year as the registration fee. I bet, any serious blogger can earn more than $10 per year from AdSense through this site. I have been blogging since my college days but after two years from the starting day only, I recognized the importance of having a domain name. Once I bought the address CoreNetwokZ.com, I understood its importance. It gave a professional touch and gradually helped me to increase the visitors' count. One advantage of starting with Blogspot is the facility to use the custom name even if you are hosting your site in their server. So you can avoid the expenses of buying a server space. Definitely, a custom domain name can make your blog promotion easier. To learn about the promotion, click on the link below. Nice post, but you are leaving out alot of details. The process is a lil more difficult if you really dont know what you are doing....but if i can do it, being a complete newbie. Then i guess anyone can do it. Thanks for the post. Are you looking for domain name or free domain based email service ? If you are looking for custom domain name based email service, you can use Google standard business App. I want a custom domain name for my e-mail.What I have searched all are paid..I have seen some AOL service but not allowing sign-ups more in it. If you can tell me where i can get a custom e-mail domain..Please help!